A long time ago, in a galaxy far, far away…To millions of people, those words signal the start of something special. It’s a promise of a trip out of your own galaxy and into a blend of fairy tale heroics, sci-fi adventure, and worlds full of Characters you know like family. Not only is that promise alive and well at the Disneyland® Resort and Walt Disney World® Resort, but it’s taken to the next level: now, the heroics of the Star Wars universe are all around you, the adventures are yours to take part in, and the Characters are ready to stand by your side. The Star Wars experiences at the Disney Parks are so rich in detail, you really feel like you’re exploring alien worlds… and every explorer needs a guide! To help you navigate this new world, we’ve created a printable “Scavenger” Hunt. Take it on your next Disney Parks visit to help you find familiar faces from the universe scattered throughout exciting new attractions and updates. 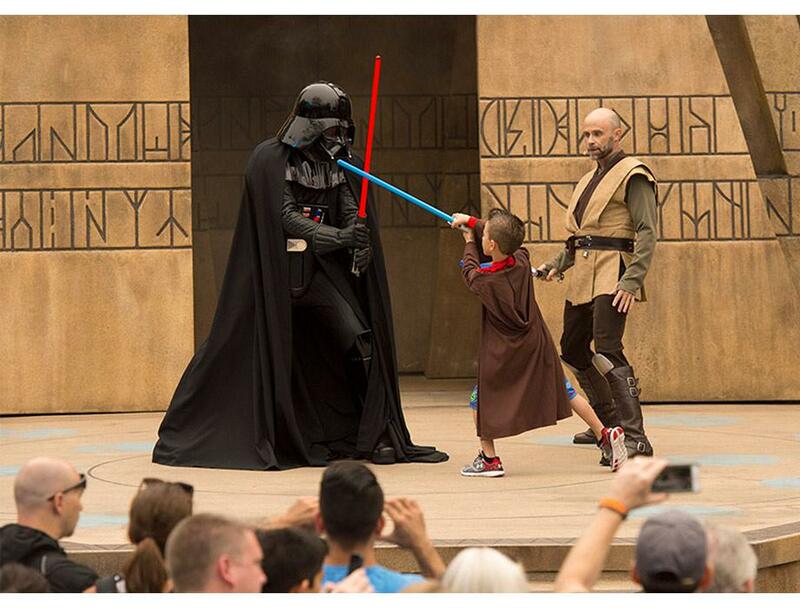 And may the Force be with you…always! Just because this is a scavenger hunt doesn’t mean we want to spoil all the surprises… a new Star Wars: The Force Awakens Character makes a special appearance in Star Tours: The Adventure Continues™, addressing viewers from the cockpit of the most famous Star Wars spaceship of all time. You can’t miss it, even during a chase through Star Destroyer wreckage on Jakku! The Star Wars fun at the Disney Parks goes back “a long time ago” indeed, before the events of Star Wars: The Force Awakens. Whether you’re exploring Tomorrowland at the Disneyland® Resort or Disney’s Hollywood Studios® at Walt Disney World® Resort, Characters and moments from Episodes I through VII surround you, waiting to be found… and to meet you, too! When you’re visiting Star Wars Launch Bay, make your way through the exhibits of props, replicas and some original items from the Star Wars universe, and into stations where classic Characters are way more than displays – they’re in attendance and in the flesh! Well, in the fur, in Chewie’s case. Along with the world-famous Wookiee, we’ve seen Boba Fett storming the halls of Star Wars Launch Bay… who knows who you can encounter next. There haven’t been this many Characters in one spot since the Mos Eisley Cantina (bonus fan points if you get that reference). Just keep your cameras ready, Jedi. These are the photo ops you’re looking for. 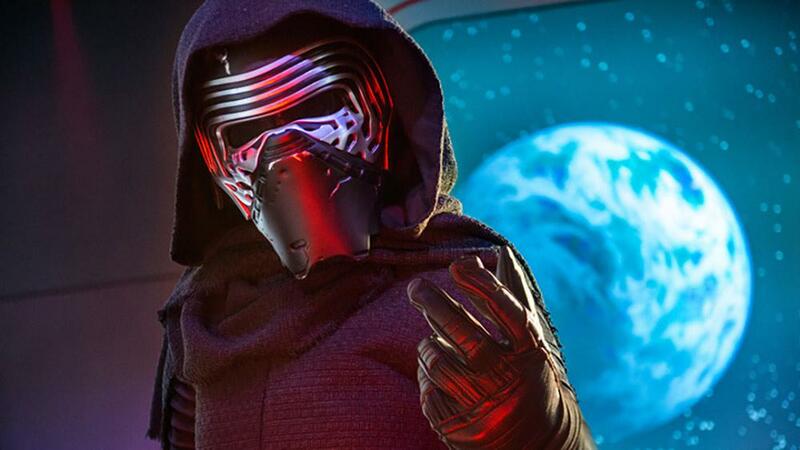 Disney Visa® Cardmembers can even go toe-to-toe with Kylo Ren in an exclusive Character Experience in a private location at both the Disneyland® Resort and Walt Disney World® Resort!1,2 Not a Cardmember? 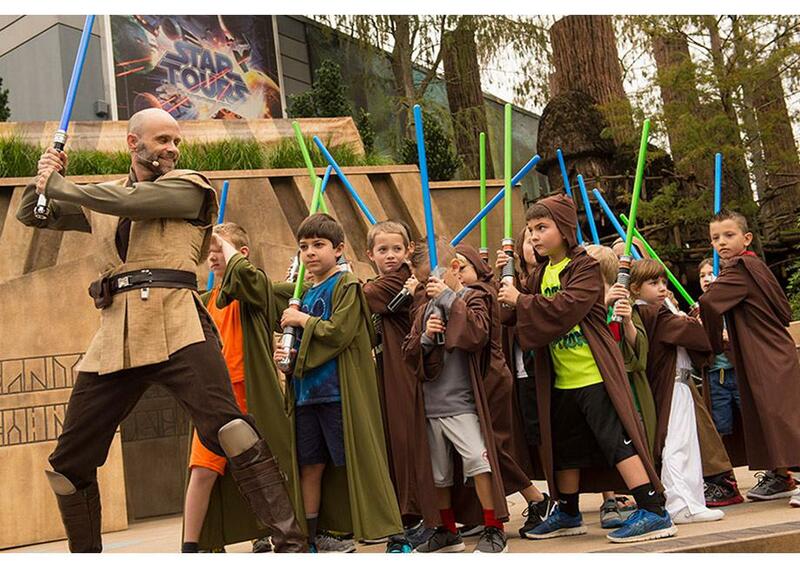 See how you can feel the power of the Force with galactic rewards and perks. May the Force be with you, always! The original presentation Star Wars: Path of the Jedi™, at the Disneyland® Resort and at Disney’s Hollywood Studios® at Walt Disney World® Resort, tells the epic story of the Skywalker clan, from young Anakin’s rise to power to Luke’s defiance of the Empire, all leading up to the Star Wars: The Force Awakens trailer that made audiences worldwide stand up and cheer. Star Wars: Path of the Jedi™ does more than retell this classic tale, though: the theater comes to life as spacecraft explode in battle and lights shine and reflect through the darkness every time a lightsaber activates or a blaster goes off, making all these immortal moments feel new! Star Wars quotes are on every fan’s mind, and they’re out in full force throughout these events. The iconic lines, “A long time ago in a galaxy far, far away…” welcome you to Star Wars Launch Bay, and “May the Force be with you” bids you farewell as you reenter the parks. Guests at the Disneyland® Resort will hear a fan-favorite line exclusive to Hyperspace Mountain, as their trip through hyperspace brings them up close and personal to a Star Destroyer and the line from Return of the Jedi: “It’s a trap!” Quoting along is not only allowed, it’s encouraged! What intergalactic explorer wouldn’t come back with a few mementos to show their home planet? There’s plenty of Star Wars merchandise and gear exclusive to the Parks to make collectors’ heads spin even more than R2-D2s. The gallery of Star Wars-inspired artwork, costumes, and life-sized models at Star Wars Launch Bay will launch a whole galaxy of gift ideas, and the limited-edition Star Wars Launch Bay pin and t-shirt make for quite an adventurous combination. Plus, souvenir cups are calling, like the BB-8 lemonade cup, the Chewbacca cup, and the First Order TIE Fighter popcorn bucket. These items are so exclusive, you’ll blow a lucky Star Wars fan’s mind better than any mind trick when you gift them. These go alongside the Parks merch fans have enjoyed for years, including the fan-favorite “Build Your Own Lightsaber Station,” where you can build a saber you favor before you test your own Force powers against baddies at the re-imagined Jedi Training: Trials of the Temple. You’ve seen these intergalactic adventures play out for years; now’s your chance to step into one all your own. Every family could use a little droid around the house, right? All across the Parks, the new Characters of Episode VII come to life – and home with you – with merch including new gear, action figures, and (how’s this for awesome?) a BB-8 you can operate and steer with a BB-8 app downloadable to your iPhone or Android. So plan your next visit and use the Force – and this guide – to explore the galaxy far, far away: it’s never been closer. Cardmembers receive 10% off select merchandise purchases of $50 or more at select locations throughout the Parks.